best yuri Ive seen yet. This is the best yuri anime I have seen so far. I love the fact that it deals with the reality of the difficulty that comes with being different. the concept of the story is not limited only to homosexuality but it can be applied to other sub groups that do not regularly fit in with the normal school body. Its a great story of a girl finding out that the love she had for her childhood friend was not just friendship but real love. This anime will give you a "Bear Shock"
I reviewing this because this is a good anime exploring the importance of LGBT Issues. Just at least give the first 4 episodes, because that's when the story start toe piece together. The story is told though elaborate metaphors & allegory so it's certainly not light watching material but yet beautifully told story. It explores issues issues of love, acceptance & homosexuality & the story can get heavy handed at times. Just about everything has meaning of some sort & even thou not straight out apparent at first, you would have just have to think about it to figure it all out. I still have a few unanswered questions that I still yet to figure out. there is one thing that might put some people of from watching is the "Fan service" problem. Some may be put of because of what appears to be un needed fan service scenes even I tend to ignore certain anime because of it. Here these scenes are more to service the story more than the viewer gratification. I know this is not for everyone as it needs the right sort of mind set to enjoy this sort of anime, but for those that are more than willing, its a master piece. Yurikuma Arashi is the latest surreal fairy tale from the legendary Kunihiko Ikuhara, and while a little short for my tastes, it doesn't disappoint. With his signature surrealism and symbolism, it tells a story of forbidden love and friendship in a world where schoolgirls and predatory bears live separated by the Wall of Severance. It is both a bizarre and playful tale, and a scathing examination of the Yuri genre, Japanese conformity, and the treatment of both female sexuality and lesbians. If you loved his earlier works such as Utena and Mawaru Peguindrum, you'll love Yurikuma Arashi. 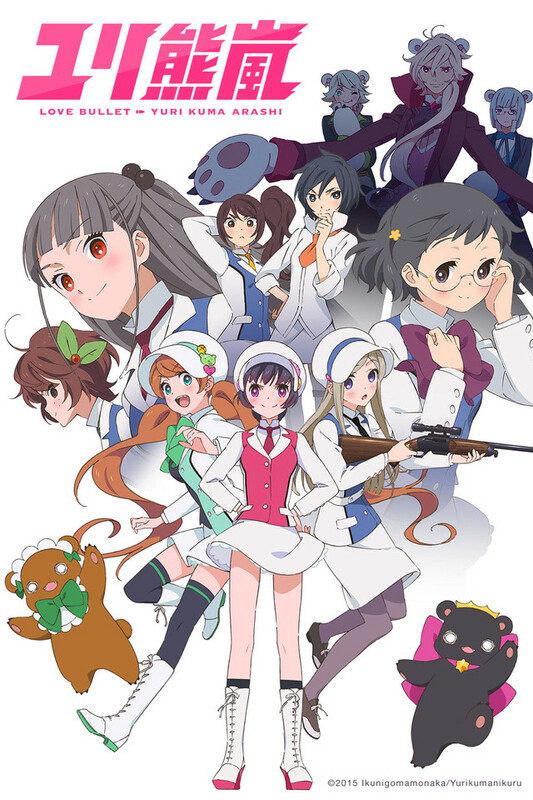 Yurikuma Arashi was one of those anime shows I had wanted to see for ages mainly because is got such good reviews. Now after having seen the entire series, I can totally see why. There truly is a lot of symbolism in this anime. I suppose what it boils down is the question of what one will be willing to do for the person they love most. How far would that person be willing to go? What barriers would they be willing to break, and would they risk death for that person? The metaphors and symbolism are a little over done at certain points in this series, the the message is clear. Another issue I had with this anime was that at the very beginning I didn't know what the hell I was looking at. I will say though that if you can push through at least the first three episodes, you'll find a story that's incredibly hard to stop watching. Have you got time to see bears vs people? When I first watched this I had many ideas on how it should go, also being confused but relieved at the same time. It's a very bright and mysterious show. The opening is so good with the smooth voice you'll just have to have it on repeat. Expect yuri (since it's even in the name). So I have a question, would you die for the person you love? Would you do anything and everything for them? Would you kill for them? Well think about that while being plummeted into a jury system. But in the end you know we will all feel the same about everything. Member 1 - Rated 1 out of 5 stars. Member 2 - Rated 5 out of 5 stars. Member 3 - Rated 5 out of 5 stars. Overall rating: 3 out of 5 stars. Viewing was cancelled due to overly-sexual content. At first I was really confused. As the show goes on you start to understand the metaphors and symbolism and then the meaning gets pretty deep. Here's how I interpreted it: It's about how society is cruel to those who don't fit into boxes, especially about how we persecute people for who they love, for being gay or for loving someone from a different group/race. It also deals with society's twisted concept of "purity" and how we paint people who are different as evil and accept doing horrible acts in order to punish that "evil". We end up committing sins that we accused the "evildoers" of and we don't see the hypocrisy in that because we are so convinced that we are the ones who are right and good. It also shows how we hurt the ones we love with jealousy, selfishness, and pride, especially when we are trying to fit in or when we feel excluded. I think it might also be commenting on how girls turn on each other and police each other, monitoring each other's lives and going behind each other's backs as we all try to fit in and not be the one excluded. There are parts with phones that I think might be references to cyber bullying. It comments on what true love is and what true friendship is and seems to say that real love will smash who you were to pieces and make you willing to sacrifice yourself for the one you love. The show ends with the message that even though the love that the two girls had was different, it was a pure love.